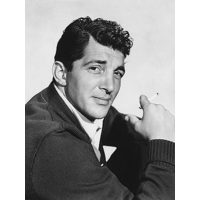 Dean Martin (June 7, 1917 – December 25, 1995), born Dino Paul Crocetti, was an American singer, film actor, television star and comedian. Martin's hit singles included "Memories Are Made of This", "That's Amore", "Everybody Loves Somebody", "Mambo Italiano", "Sway", "Volare" and smash hit "Ain't That a Kick in the Head?". Nicknamed the "King of Cool", he was one of the members of the "Rat Pack" and a major star in four areas of show business: concert stage/night clubs, recordings, motion pictures, and television.